The myth of Prometheus and fire makes us contemplate on a serious question: If Prometheus hadn’t stolen the fire from Zeus, what the mankind would have done? But the mischievous Titan in the Greek Mythology stole it and while he was celebrated by the mortals he was cruelly punished by the God of all Gods. 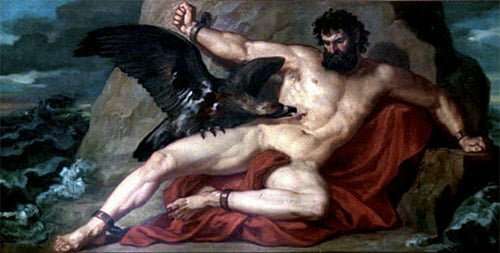 Considering this Prometheus’s deed as one of the biggest crimes ever – although it was not the first time that Prometheus tricked Zeus – the Mighty God had Prometheus chained to the rock where the eagle was to eat his eternally replenished liver every day. What a dispute between mortals and immortals! And what a great story for artistic expressions and theatrical plays! And most importantly, that punishment was not the end of the tale of Prometheus and Zeus. But let’s start from the beginning. Prometheus was one of the Titans, who at some point were sent to Tartarus by the enraged Zeus who didn’t accept the Titans’s fighting against him in the famous Battle of the Titans – Titanomachy. However Prometheus was not directly involved in the war, so Zeus saved him from Tartarus and gave him a mission – to form a man from water and earth. Prometheus accomplished the task, but while working on his creation, he grew fond of men. He didn’t care much ever about the Gods and their hierarchy, and however friendly treated by them, he was much more comfortable being around the immortals. In any case, Zeus’s idea was not to have men with any unusual power. 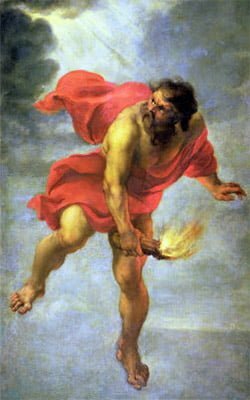 But Prometheus was thinking the other way, and decided to steal one of the powers Zeus was particularly sensitive about – fire. Thinking about stealing fire was easy, but it finally proved a bit more complicated. Prometheus, known for his wit and intelligence, had an immediate plan – to trick the goddesses throwing them a golden pear (in some version – apple) into the courtyard with a message: “For the most beautiful goddess of all”. It worked as he planned – the goddesses started a fight over the fruit while gods were completely enjoying the scene. All of them were distracted and Prometheus didn’t have a hard time stealing the fire from Hephaestus’s workshop. Hephaestus was, among other stuff, the Greek god of fire. Prometheus happily left the Gods’ playground and took the fire with him either in a hollowed pumpkin or hollowed reed (depending on the interpretation) and brought it to Earth and gave it to humans. Oh, how Zeus was mad. After so many times being defied by Prometheus, Zeus decided that it was enough. Nevertheless, he made Hephaestus himself to chain Prometheus on Mount Caucasus where the eagle would eat his liver forever. But, time passed and Zeus offered at one occasion to free Prometheus in exchange for a revelation of the prophecy that predicted the dethroning of Zeus. Prometheus refused. But much later Zeus’s son Hercules, on his journey to fulfill the Twelve Labors, passed by the Mount Caucasus, saw Prometheus and decided to kill the eagle and free the chained Titan. Zeus was very angry initially but eventually agreed to grant Prometheus his freedom. Well, some sort of freedom since Zeus wanted Prometheus to carry a reminder of his punishment forever – he ordered Prometheus to make a steel ring from the chains he was in, and wear that ring from then on. Since then, the mankind started creating rings in order to celebrate Prometheus and commemorate his help. Nice! I like all the detail in this post about the myth of Prometheus. It’s going to help a lot with my Latin project. wait wait wait, i thought that eris that dropped the apple which said “To the fairest” and that started the Trojan War. But aside from that great summery. No, the story of the Trojan war was similar, though. Instead, a mortal was asked to pick the fairest goddess (I forget which three were involved, but I know Aphrodite was one). The golden apple was still a thing in the Trojan War story, though. The three goddesses, Hera, Aphrodite, and Athena, asked the mortal (Paris) to choose who the apple was meant for. Aphrodite promised him the most beautiful woman in the world, so he gave her the golden apple. The most beautiful woman was Helen, who was already married, so Paris basically just kidnapped her and her husband declared war. Zeus was believed as “The God of ancient greek mythology” and this story is a brief view of the many terrible things he has done from his anger. For instance, in the myth that includes the characters Jason and the argonauts. King Phineas the great who ruled over the Aegean Sea had done nothing to harm Zeus, but he sent three terrible Harpies down to eat everything he tried to. Jason and the argonauts eventually saved him from this curse. The three goddesses were Artemis / Diana, who tried to bribe Paris with a hunter’s skills. Athena / Minerva who tried to bribe Paris with infinite wisdom and Aphrodite / Venus who bribed him with the most beautiful mortal for wife. Hera / Juno was NOT involved. Actually it was Hera/Juno that was involved not Artemis/Diana . Hera offered Paris ownership of all of Europe and Asia.